As the holiday season is approaching really fast, we sometimes run out of gift ideas to give to the little ones, especially to our kids! 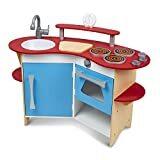 But if they are wholly inclined to cooking, aspiring to be chefs someday, or perhaps fond of playing with kitchen toys, there’s a creative and unique playset that your kids will truly enjoy. Because you can’t let your children play around with sharp knives and other utensils in a real kitchen, why don’t you give them their own where they can play more safely? That’s right. A Play Kitchen is all that you need. It exhibits the corners, utensils, and accessories that you usually see in a real kitchen. While they’re having fun with this innovative kitchen playset, it enhances their creativity, practical role-playing, and interaction. 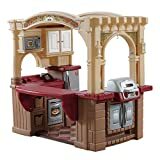 With great consideration of all the factors mentioned, the next step is to find the kitchen playset that your kid would love. And to give you only the best of the best Play Kitchen toys on the market, we’ve listed down the Top 10 Best Play Kitchens of 2019! 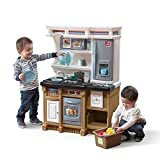 This Grand walk-in Kitchen and Grill toy set from Step2 offers you a realistic kitchen that includes almost all the parts and accessories that you usually see in a real kitchen. It has a corner for grilling, dining, cooking, and even baking! 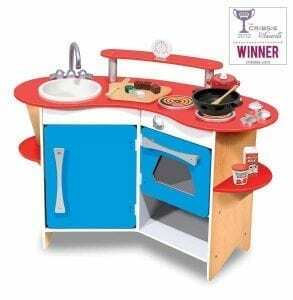 Once your kid steps into this creative, wonderful kitchen playset, he’ll definitely have a lot of things to have fun with. To make this play kitchen toy more interactive, Step2 includes a 103-piece accessory set of play food, pans, and cooking accessories! That’s more than enough of what your child can play! It has the realistic electronic features that light up like a fire. And even if you have 2 or more children or you’ve got your child’s friends to come over for a cooking role play, this kitchen toy set is large enough for everybody. 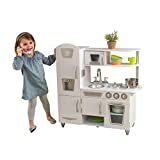 For a neat and dainty kitchen playset, this KidKraft Vintage Kitchen in white is probably one of the best options your kid will love. You won’t also need a large space in your home or your kid’s playroom. 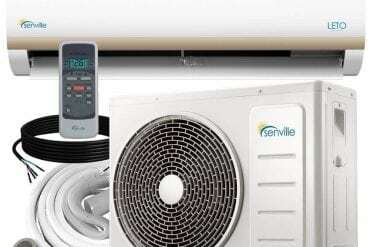 It comes with a realistic sink, stove and microwave oven. The storage cabinets are also functions which provide space for all the other kitchen toys. This will also help your kid tidy up all the toys easily after playing! To give a more realistic touch of a kitchen, it features oven and refrigerator doors that open and close. There’s also a cordless phone toy right above the kitchen sink that your kid can play with. It has a sturdy construction that will last for years and years to come. As long as your kid is 3 years old and above, this would be a perfect gift! Are you looking for a kitchen set that showcases a theme and color for your boys? 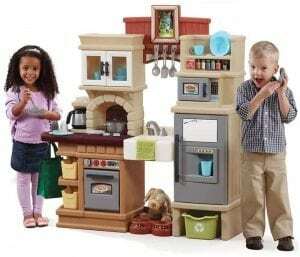 This Custom Kitchen Playset from Step2 might be a great option to consider. Because it exhibits subtle colors of blue, gray, and wooden-style finish, this would be a good fit for your lovely boys. Your pretty little girls can play with it, too! This compact design includes 20 pieces of accessories of kitchen utensil toys. No need to purchase them separately! And because it features sounds and other realistic parts and pieces like the microwave, refrigerator, sink, electronic sounds, and pretend stainless steel oven. This playset becomes more interactive and enjoyable for the kids. 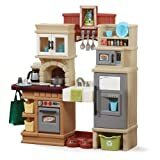 If you’re looking for another creative and interactive play kitchen set for your kids, grandchildren, nephews or nieces, this Little Bakers kitchen playset from Step2 is a stunning piece to check out. This Step2 Little Bakers Kitchen Playset is an excellent option for those kids who love to pretend baking cakes and making tasty pastries. It includes 30 pieces of accessories like bowls, pans, toy cupcakes, and other utensils. 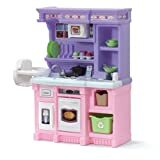 Apart from its sweet hues of pink and purple, it features an oven, microwave, fridge, electronic burner, and a frying pan and boiling pot that make frying and boiling sound for a more realistic touch! There’s also a mini high-chair attached to one side where your kid can place her favorite doll. 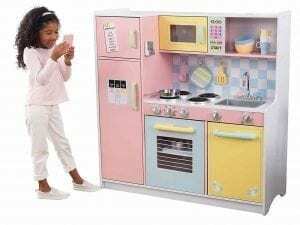 If you want to treat your lovely daughter with a unique present for the holidays, this Big & Bright Kitchen from KidKraft surely is one-of-a-kind. 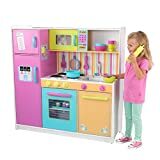 Apart from the sweet and pretty neon colors that would definitely catch your daughter’s eye, this kitchen playset showcases all the parts, utensils, and accessories that you’d usually see in your kitchen at home. 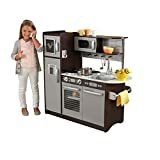 This playset comes with a removable sink, oven, refrigerator, microwave oven, and gas stove where the knobs turn and click to make it look more realistic. The doors also open and close so your kid would really feel like working in her very own kitchen. And because the cabinets are also functional, they can serve as storage areas where you can put the accessories and toys away after playing. 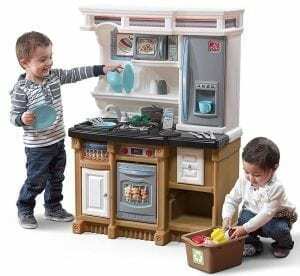 Here’s another excellent gift idea for your kids – the Step2 Heart of the Home Kitchen Playset. Your young aspiring chefs would definitely enjoy its creative theme where they can role-play cooking and at the same time, train them to nurture their beloved pets. This playset also comes with a nurturing pet corner where your kids can play with their pet toys. When it comes to the whole design, you’d see beautiful intricate details that pattern a real kitchen. It has a refrigerator, a sink, stove, oven, microwave, functional cabinets, and even a coffee maker! These pretend appliances will surely give your kids a good time. There are also realistic bubbling sounds on the stove and ringing tunes on the phone. With its 41-piece kitchen accessory, it makes the playset more interactive and fun to play! If you want to keep it plain and simple yet interactive, this corner wooden kitchen playset from Melissa and Doug would be a great option to try. It is not as extravagant as the other playsets that you’ve seen on our list or out on the market. 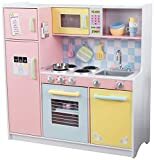 But this durable toy kitchen is made of quality materials that will surely keep your kids entertained for more years to come. 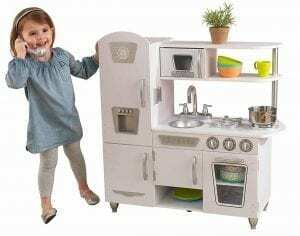 This play kitchen set features a sink, sink, stove, and functional storage spaces where you can put all the other kitchen toys. It also has a 3-minute timer that can challenge your kids to a competitive cooking show! Besides these stunning features, moms won’t even have any a headache cleaning this up. It’s easy to clean and maintain. And while your kids are having fun, this imaginative play enhances their learning and interaction. KidKraft truly knows how to capture a child’s heart! This KidKraft Large kitchen playset comes in a variety of playful soft colors that make the playset more appealing and enjoyable to play. 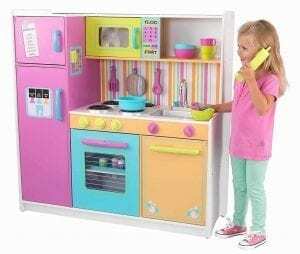 Just like the most KidKraft playsets, this one also comes with a fridge, microwave oven, oven, cordless phone, sink, stove, and storage cabinets. While your kid is effectively role-playing cooking or serving guests, this KidKraft play kitchen helps enhance your child’s learning and imagination. Kitchen accessories are also included such as cooking utensils, cups, plates, and pans. These will make the playset more realistic and fun to play with. And if you have two or more children or your child’s friends love to come over and play, this kitchen playset is large enough for everyone! 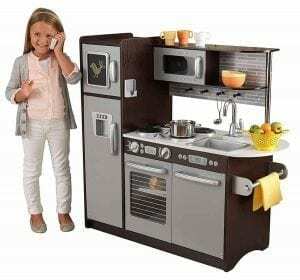 Still can’t find a nice kitchen playset for your little lady chef? 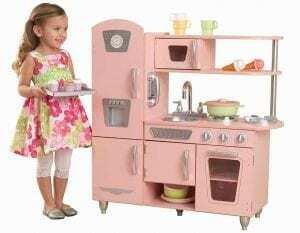 Perhaps, this KidKraft Vintage kitchen in Pink will warm her heart! 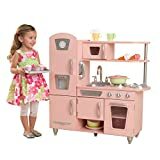 Aside from its lovely pink color, this kitchen playset comes with lifelike kitchen features that your daughter would love. It has a fridge, microwave oven, kitchen accessories, a sink, and a wireless phone. If your kid feels like making baked goods, she can put those cupcakes and other tasty baked goods inside the pretend oven. Knobs click and turn. The fridge and cabinet doors open and close, too! This vintage kitchen is easy to assemble. And because it is made of quality materials and a sturdy wood, your daughter will surely enjoy playing with it for long periods of time. Since KidKraft has been among the most trusted brands for interactive toys, no wonder the KidKraft Uptown Espresso Kitchen takes the first spot on our list! As one of the best-sellers and the in-demand kitchen playsets on the market, this Uptown Espresso Kitchen showcases a sleek and elegant theme for your kid with its hues of gray and wooden brown. It also complements your kitchen interior, too! KidKraft Uptown Espresso Kitchen would also be a great option if you have two or more lovely little darlings who aspire to be young chefs someday. It comes with a refrigerator, freezer, oven, and a dishwasher. To make all the parts and pieces more realistic, the doors open and close, the knobs click and turn, and a towel handle is attached on one side. Your kids would definitely enjoy playing with this wonderful playset! 1. 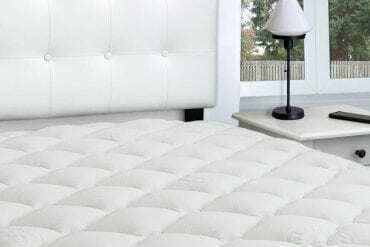 DURABILITY: It is always vital to know the quality of the product you’re buying. 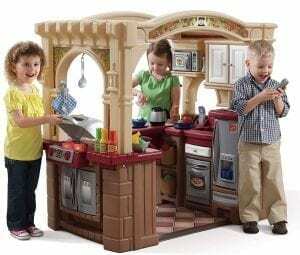 When it comes to these kitchen playsets, you have to check if the material is of its superior durability. Although most of these playsets are made of plastic and known to be less prone to damages, make sure it has the quality that your kid will continuously enjoy for the longest time possible. 2. THEME: There are a lot of themes and designs to choose from. Manufacturers make sure that every concept is very appealing to the kids. As it patterns the real-life kitchen, you can see a complete set including the utensils for cooking, grilling, dining, and baking. There’s also a faucet, sink, refrigerator, microwave oven, oven, dining table, and a lot more. These playsets also come in a variety of colors depending on what your kid prefers. Whether you have a son or daughter, there is certainly an available and suitable color and theme. As every concept showcases a different size, it is essential to consider your kid’s height, age, and the space in your home where you would place the playset. 3. ACCESSORIES: The accessories make the kitchen set more enjoyable and more attractive. Some include over a hundred of kitchen toys and utensils while the others only have a few. Although some may suggest you buy separate kitchen sets, It would be a better option if the one you’re buying has all the kitchen accessories your kid would enjoy playing. 4. ASSEMBLY: The assembly is one of the most significant struggles. As the adults or the parents are the ones to do this, try to find the one that is easy to set up, especially if you’re going to do it on your own. Your kid must be thrilled to try it as soon as possible! 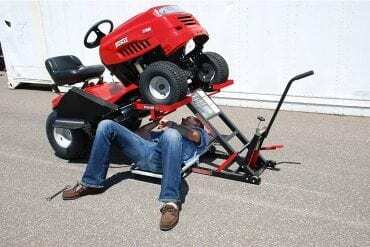 In regards to the easy assembly, the customer reviews can also be a reliable assistance. 5. 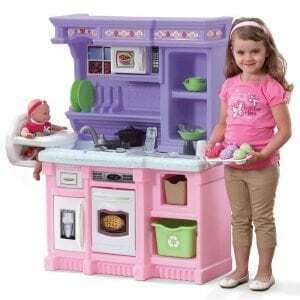 AGE and WEIGHT REQUIREMENT: There’s always a recommended age group who can use the particular play kitchen set. 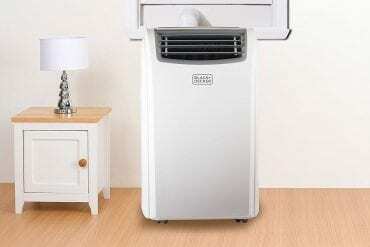 Some parts and accessories of it might be suitable for toddlers or kids younger than the recommended age. The weight and the size of the kid are also significant considerations. If your kid does not meet these requirements, you may look for another brand or type that is suitable for him/her. We always find the best presents for our kids. And if you’re still having a hard time finding what your kids would truly love and enjoy, you can try these interactive and innovative play kitchen toys. Apart from keeping your kids entertained, these kitchen playsets encourage your child’s learning and imagination which will help them interact more efficiently in the long run. Because we only want the best for you and your kids, we’ve come up with this list of the top play kitchen sets. We hope our guidelines and reviews had helped you find what you’re looking for. If you have any questions or concerns, share them in the comment box below. We’d love to hear them all! Thank you so much for this extremely informative content. I’ll surely read and re-read it many times over.